Fix this common home problem in no time. With redecorating comes fluffy new throw pillows, coffee table accents and, oftentimes, the shuffling around of wall art. If unsightly nail holes are stepping in the way of your feng shui, there's an easy way to cover them up. The trick? Simply rummaging through your kid's backpack! The 'hole' truth about filling in nail holes: It's easy! Sure, you could plaster, sand and repaint or head over to the home improvement store for a wax filler stick, but in a pinch — and in more than 96 colors — you can nail this project with regular old crayons. 1. Choose the crayon that most closely matches your paint color. 2. Build the wax into the hole starting along the edges and working your way toward the middle of the nail hole. 2. 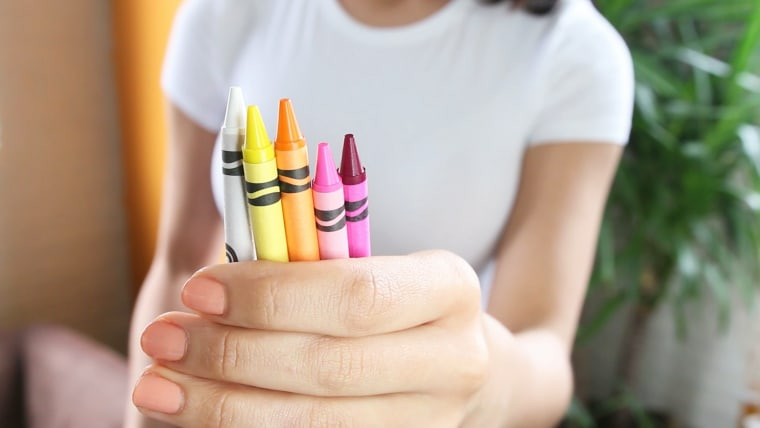 If you have a larger, more ambitious hole from removing a bracket or anchor, warm the tip of the crayon with a lighter to soften the wax before filling the space. 3. Finally, use the warmth of your fingers to smooth out the surface. You can also blast warm air from a blow dryer 5-6 inches away, being careful not to melt the wax. That's it! See, it's child's play. If you're ready to hang your artwork again in a different place, try this easy trick for perfect placement. Need help hanging art on your wall? Get the fork out!